From the left, senior Olivia Galasso, junior Hannah Hoyt of Menands, junior Seiji Akera and sophomore Macy Hayes pose in front of the event sign of the 16th annual Prize in Medicine and Biomedical Research Program and Ceremony at Albany Medical Center on Wednesday, Sept. 28. Four Tech Valley High School students were the guests of Albany Medical Center on Wednesday, Sept. 28 for its 16th annual Prize in Medicine and Biomedical Research Program and Ceremony. 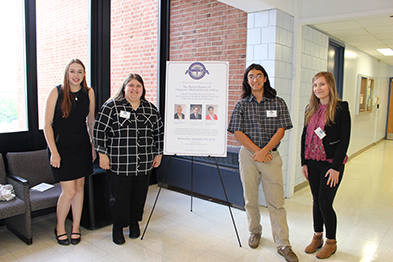 Senior Olivia Galasso of Cobleskill-Richmondville, juniors Seiji Akera of Berlin and Hannah Hoyt of Menands, and sophomore Macy Hayes of Menands got the opportunity to observe grand rounds by three award-winning doctors. Drs. F. Ulrich Hartl, Arthur L. Horwich and Susan Lee Lindquist were recognized by Albany Medical Center for their fundamental and complementary discoveries related to the mechanisms of protein folding. The opportunity was made possible through the continued partnership TVHS has with Albany Medical Center, which provides students with experiential learning in careers through the TVHS I-Term program. Albany Medical Center has continued to host a group of TVHS students on-site every February, allowing students to work side-by-side with professionals to learn about a particular field.